1. Preheat the oven to 220˚C, gas mark 7. Dice the pepper and onion into 1-2cm pieces. Place them in a roasting tin and add the whole tomatoes. Season with sea salt and freshly ground black pepper. 2. Top with the meatballs and bake for 15-20 minutes. Add the chopped tomatoes, basil, tomato puree to the meatballs. Stir to mix and return the tray to the oven. Cook for a further 5 minutes, or until piping hot, the meatballs are thoroughly cooked and there is no pink meat. 3. Meanwhile, bring a large pan of salted water to the boil. Add the spaghetti and cook according to the instructions on the pack. 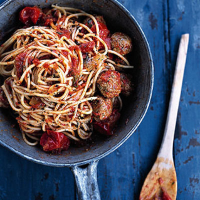 Using tongs, add the spaghetti and 50ml of the spaghetti cooking water to the meatballs and sauce. Mix well and serve with grated Parmigiano Reggiano and a dressed green salad.